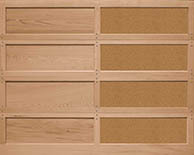 Classic raised, recessed and flush panel designs handcrafted in the beauty of natural wood. 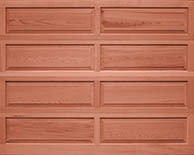 Unlock the beauty of natural wood with a handcrafted hemlock, redwood or cedar garage door from Clopay®. These handcrafted wood garage doors feature traditional raised, recessed and flush panels that allow you to choose the best look for your home and its architecture. The addition of a wood garage door from Clopay® can transform the appearance of your home’s exterior and greatly enhance its curb appeal. The CLASSIC™ WOOD collection includes a series of residential garage door options, including raised panel, recessed panel and flush panel — each offering the opportunity to dramatically enhance your home’s curb appeal. 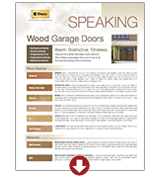 Raised panel garage doors feature long or short panels with optional windows, paint- or stain-grade wood, and the choice of hemlock, cedar or redwood. Use our online tool to upload a photo of your home and look at different options before making a final selection. Long or short panels w/ optional windows. Doors can be factory primed or finish painted white. 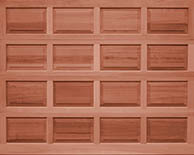 Model 20 offers Luan or Breckenridge panels, both available in stain grade or paint grade options. 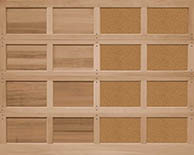 Model 10 features paint grade Hardboard panels. Three-layer construction with 1-5/8” section thickness. Smooth Luan or Breckenridge exterior panels. Doors can be factory primed or finished painted white. 1-3/8" heavy-duty stile and rail and dowel pin construction. Handcrafted wood decorative windows, available in six designs. Handcrafted decorative window designs options available on Model 20. Calculated garage door section R-value is in accordance with DASMA TDS-163. The Clopay® nationwide network of dealers is ready to assist you in personalizing the perfect garage door for your home. These dealers are garage door experts. They arrive on time, and they perform installations with meticulous precision. They clean up work areas once finished, leaving you to enjoy nothing but your new garage door and the transformed appearance of your home’s exterior. Find a dealer near you to get started!